Shifting political alignments in Nepal have New Delhi and Beijing on edge. Politics in Nepal have grown newly turbulent after the ruling coalition saw a dramatic, albeit not entirely unexpected, split. Pushpa Kamal Dahal, also known as ‘Prachanda,’ pulled the Communist Party of Nepal (Maoist-Centre), or the CPN(M-C), away from the government of Khadga Prasad Sharma Oli. Oli is a member of the Communist Party of Nepal (Unified Marxist-Leninist), or the CPN(UML). Oli became the country’s first prime minister under the nation’s newly promulgated constitution, which sparked a period of national crisis beginning last September. 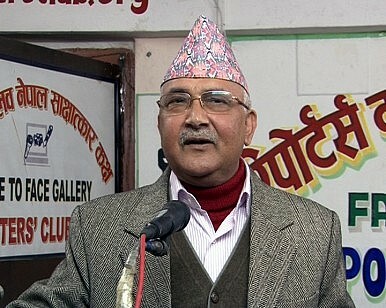 The country appears poised for a leadership change, barring some deft political maneuvering by Oli and the CPN(UML). The Maoists and the Nepali Congress parties filed a no-confidence motion against Oli and the CPN(UML), who are now in the minority after the withdrawal of Marxist support. The motion will be taken up in the country’s parliament for debate between July 21 and 23. These shifting sands in Nepali domestic politics aren’t moving entirely in a vacuum. The country has increasingly turned into a low-key geopolitical prize up for grabs between India, the country’s historic partner and benefactor, and China. As I discussed in these pages earlier this year and in issue 17 of The Diplomat‘s magazine, the historically strong India-Nepal relationship has come under pressure in recent months, fraying over New Delhi’s support for the Nepali groups protesting the September 2015 constitution. Though the government and the protesting Madhesis and Tharus came to an understanding on constitutional amendments in January, India-Nepal tensions have persisted. Meanwhile, Oli has explored outreach to China, Nepal’s other large neighbor, historically kept distant by the natural border of the Himalayan mountain range. But Prachanda has left Beijing worried with his direct outreach to India ahead of the no-confidence vote. The CPN(M-C) dispatched Matrika Yadav, one of Prachanda’s close confidants, to whip up support for the Maoists in New Delhi. Unsurprisingly, the India-backed Madhesi alliance is set to vote against the Oli government. Overall, Oli’s chances of surviving the vote don’t appear all that favorable, barring a return to unity and a change in heart by the Maoists. Whatever the results of Nepal’s ongoing political intrigue, both New Delhi and Beijing will be watching with great interest. Prachanda and Oli, between them, appear to be a playing a zero-sum game of seeking the backing of Nepal’s two powerful neighbors. Accordingly, expect the outcome of the no-confidence vote to bear on the small Himalayan nation’s position in the geopolitical calculus between India and China. A leadership transition in Nepal leaves China nervous.